1 of 3 Heat oven to 350 degrees F. Grease and flour 9-inch glass pie plate. 2 of 3 Whirl milk, eggs, flour, sugar, butter, vanilla, coconut extract and salt in blender for 3 minutes. Pour into prepared pie plate. 3 of 3 Bake in 350 degrees F oven for 55 minutes or until set. Let pie cool on wire rack. 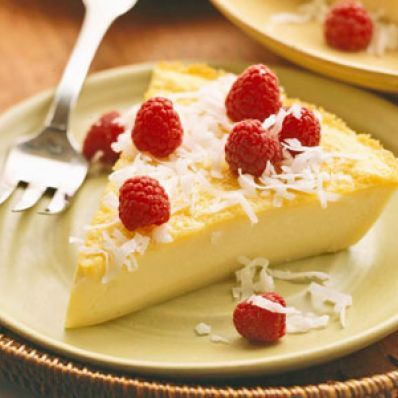 Garnish with shredded coconut and raspberries if desired. Per Serving: 195 mg sodium, 0 g fiber, 4 g sat. fat, 7 g Fat, total, 123 mg chol., 6 g pro., 17 g carb., 163 kcal cal.